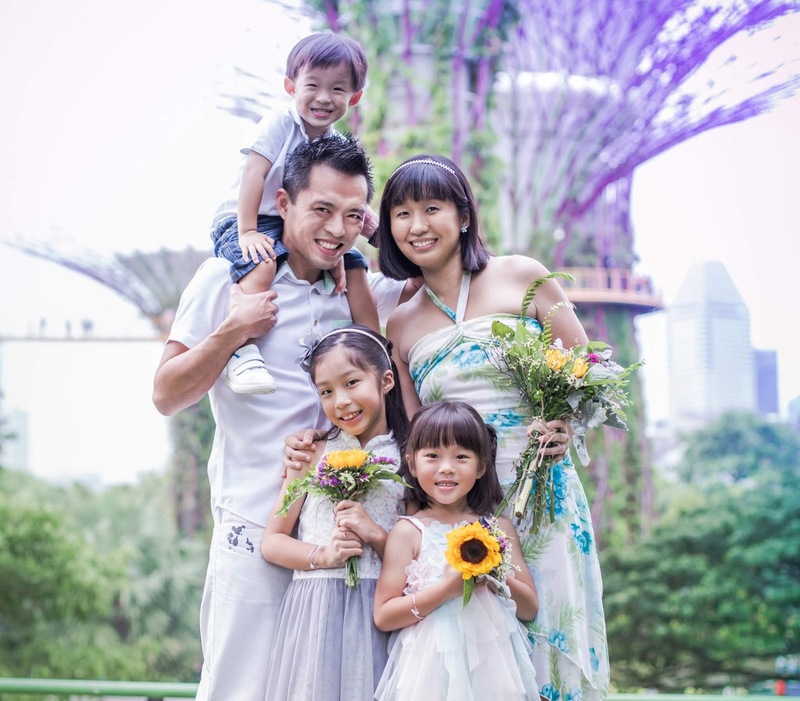 With National Day around the corner, and this being the first time we are spending it as a family here on the sunny island, it calls for a celebration. So the hubby has booked the SAF Seaview chalet in Changi where we will be spending the long weekend with our family and friends. 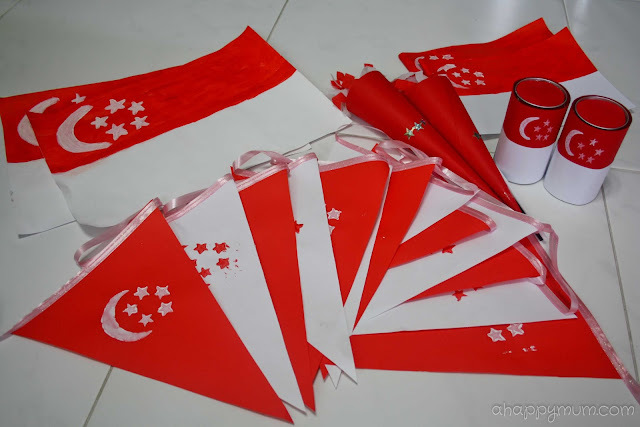 Since Angel is getting to know more about Singapore and asking us about the flags she sees in the neighbourhood, I thought it would be the perfect time to do some National Day related crafts in this week's Creativity 521. Talk about patriotism, we would always watch the NDP on television and it even made me shed a tear during the first year in Sweden. With the help of some art supplies and scrap materials found in the house, we made some decorations to spice up the chalet and party props to delight the kids. The first thing we made was a parade wand which ended up looking more like a parade cone. All you have to do is to stick a piece of double-sided tape along the width of a A4 size paper as shown, roll it into a cone shape (thinner if you wish), tape it down and cut off the extras to even the top. 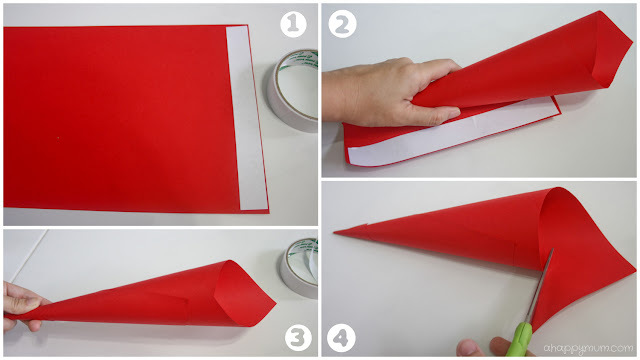 Next, cut out strips of red and white crepe paper, stick them on a piece of scotch tape and then secure it inside the top of the cone. Repeat and continue along the top. Lastly, decorate the cone with some stickers. Ta-dah! Our parade cone-wands which delighted my girl whenever she heard the rustling sounds as she shook them. Just because we wanted something 'noisier', we also made maracas out of Coca-Cola cans and green beans. This was also a great sensory activity for my girl as she scooped the beans up and put them into the tiny opening of the can. We also used a piece of paper as a funnel and let her have fun sliding the beans into the cans. 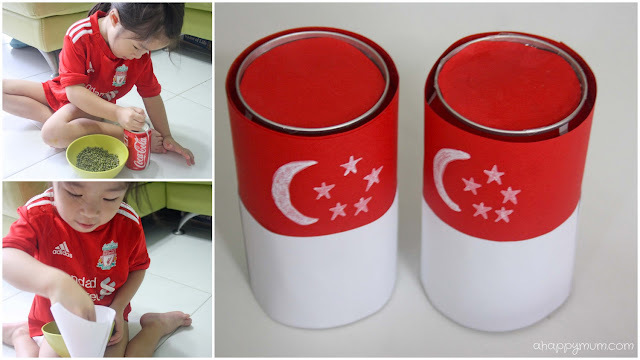 Next, seal the opening of the can, cover the body with red and white paper, draw on the crescent and stars using a white ink marker and voila! 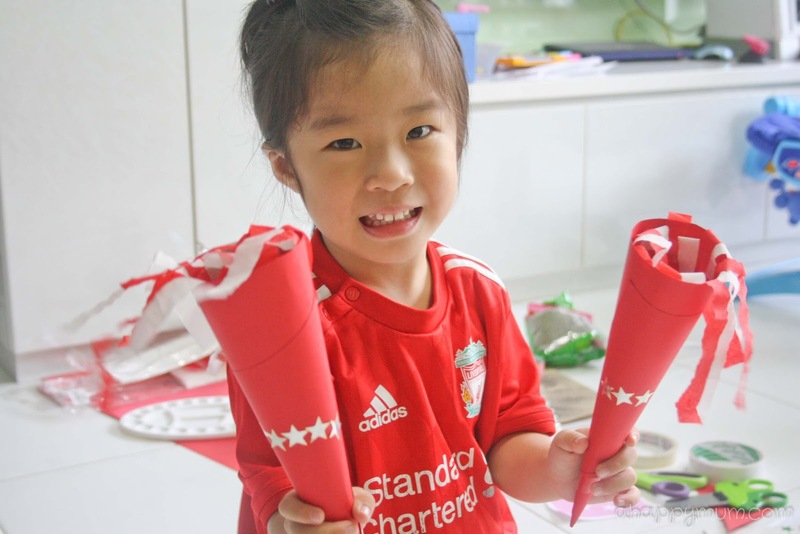 Now we have our very own National Day maracas which we can use to shake to the beat while watching the NDP. This was probably the most fun part for Angel. 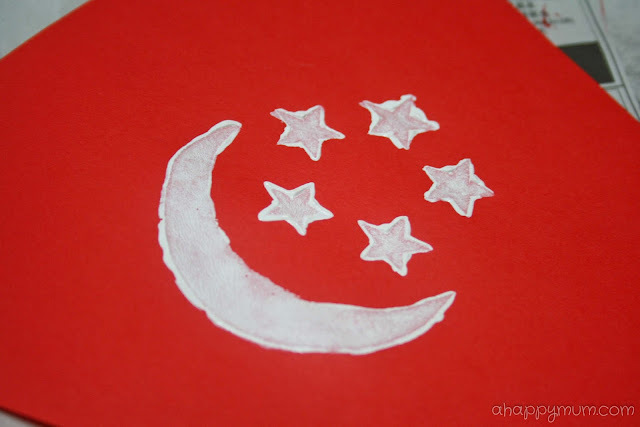 We decided to make a flag bunting and considering that it can be very challenging for a 4-year-old to paint crescents and stars, I made her a special "Singapore stamp". Firstly, print out two pictures of the Singapore Flag emblem. 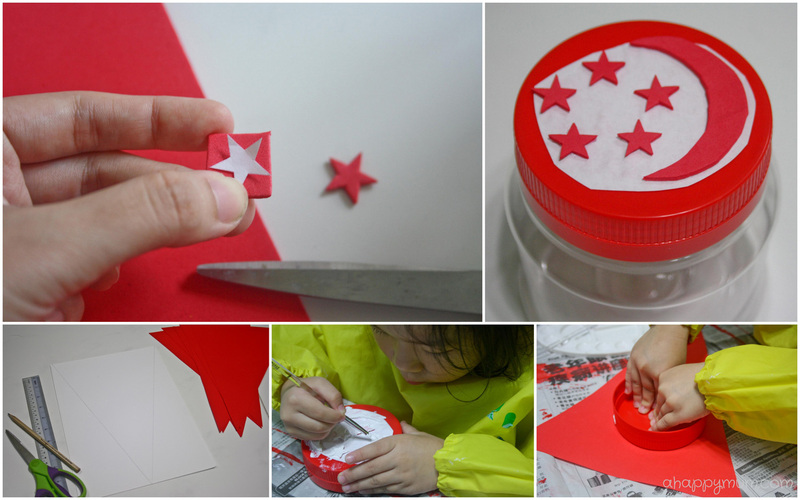 Cut out the stars and crescent, trace it on the foam paper and cut these out too. Stick the other picture onto the top of a container lid with the wrong side up. This will help you to determine the positioning of the foam pieces. 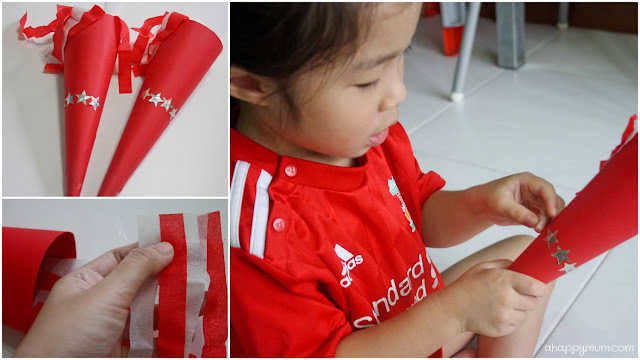 Stick them on using white glue and yes, it's that easy to make a personalised stamp! Tip: Make sure you use a flat lid for this to get a perfect stamp. After we cut out some triangular flags for the bunting, it was time to stamp, stamp, stamp! 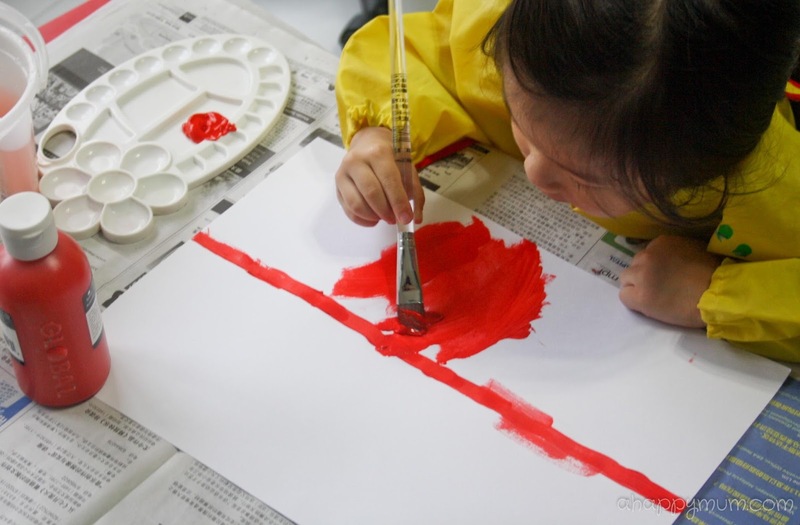 Just apply paint onto the stamp, align it on the flag and push down the lid to create a beautiful, easy and consistent emblem. Every time we lifted off the lid and saw the cute cresent and five beautiful stars, let's just say Angel was indeed over the moon. 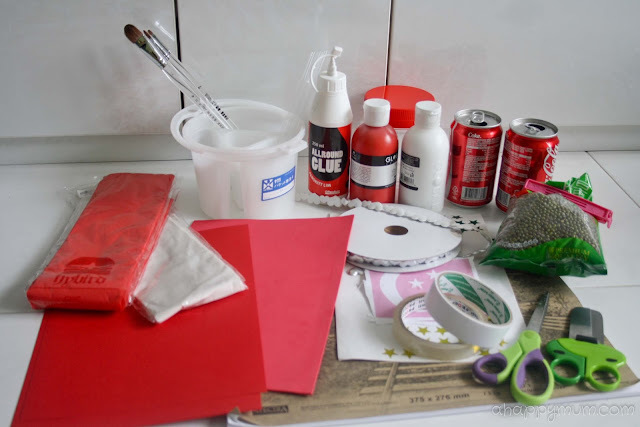 To finish the bunting, simply stick some double-sided tape at the top of the flags and add a ribbon to bind them together. 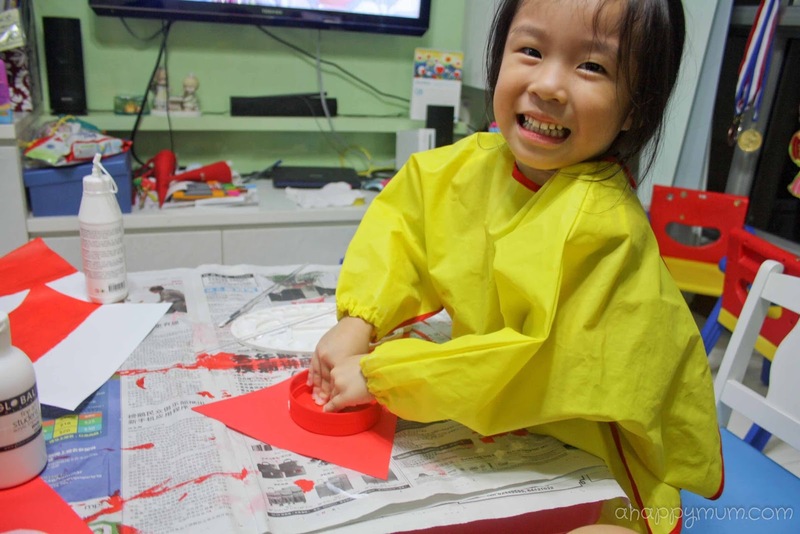 Lastly, we also couldn't miss out on letting Angel paint her very first Singapore flag. So we painted our flags on big pieces of drawing block and also painted some smaller handheld flags which we stuck onto balloon sticks. While I explained to her on the colours and features of the flag, it was also the perfect time to remind myself on its significance and the meanings behind our national flag. Yippee! This was what we achieved after an evening session of art and craft. 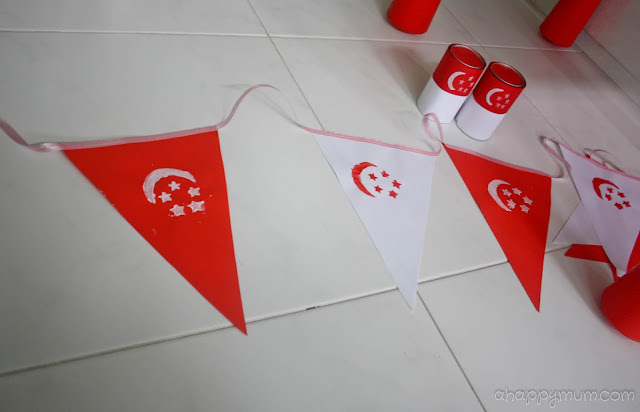 Easy, fun and inexpensive DIY National Day decorations and props! I guess we are all set and eager to celebrate our nation's 48th birthday. How about you? To fellow bloggers who have a fun craft session, DIY tip or creative idea to share, do join in the party! Highlight and press Ctrl + C to copy my button above, include it in your post/sidebar and add your link below. I will be hosting Creativity 521 every fortnightly and I hope you can join me on the 5th and 21st of every month. Remember: The sky's the limit when it comes to creativity! I really like the bunting idea, hehe, so gonna make one with the boys to hang proudly at our front door! Hee great! I hope you'll have lots of fun with them doing it too! =) thanks for reading! The Singapore stamp is so cute! The cones too! Maybe we will do that! Keke I like the stamp best! 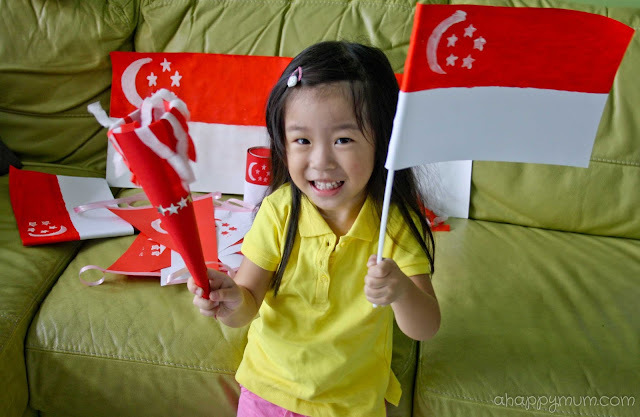 Cool, have fun and keep your National Day series coming! =) Oh I will see you for movie date soon! Hehe thanks much! 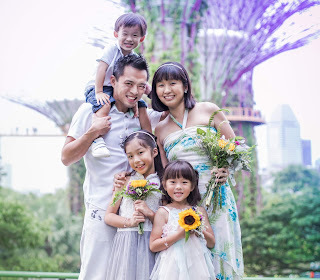 =) Hope you and your family have a great holiday too and thanks for linking up! Its always fun to spend time with your kids.Rather than letting them watch cartoons or play games on the tablet, making crafts would be a better choice. Definitely, crafts over ipad anytime. Well, we don't even have an ipad, smart phones are bad enough! Haha. Thanks! Nice ideas! I made "wands" with my kids too, but I used a pair of disposable chopsticks and crepe paper streamers. Definitely much more basic than yours :) I love the stamp!